Clayton football star Savion Jackson is a prized commit for N.C. State and he says faith and family led him there. CLAYTON, NC (WTVD) -- Clayton senior defensive end Savion Jackson recently committed to play football for NC State University. The No. 2 ranked recruit in the state had 23 Division 1 offers, but it was his faith and family that led him to NC State. Growing up, Jackson overcame much adversity, with his father out of the picture, his mother struggling to pay bills, it was the family's faith that carried them. "Pretty early, he saw that there was a need to take care of mom and help her as much as possible with his siblings," his mother, Ranada Jackson said. "He is a phenomenal example of character with his family, with his brothers and sisters that are looking up to him, and children need an example of character to follow." Raw video: Savion Jackson's mom talks about her son, hard times, and keeping the faith. Starting as a freshman in high school, Savion would go from school to football practice to work at Domino's Pizza then back home to do homework -- five days a week. Giving his entire paychecks to his mom. "It's been tough, but like, my mom is very strong, a strong mother," Savion said. "If my mom just needed a need or my family needed a need, I would just work my tail off so I could just help out in any way possible." "Most kids want to take out and buy themselves a pair of shoes or something like that," Ranada said. "But, he wanted to do it the other way. 'Do what you need to do, and then if anything is left, I just need a couple of dollars if I just want to get a burger or something after practice.' I would say no, no, I'm not going to take your money. But he wouldn't have it any other way. It was never about him." Clayton coach Hunter Jenks has nothing but praise for Savion, both for his play and his character. Now, Savion says a burden has been lifted off of him knowing his mother won't have to worry about paying for college. "State was that one for me because I mean, when I went there, every time, I just felt like family," Savion said of choosing the Wolfpack. "I could say anything I wanted to. Just act regular." 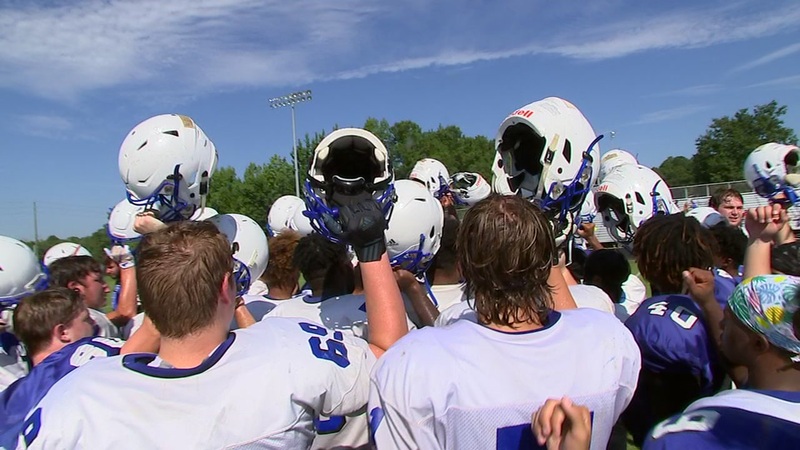 The Clayton High School football team only lost one game last season, in the third round of the playoffs. This season, the Comets' goal is simple -- beat every team. Savion said without God, he wouldn't be where he is today. His mom agreed. "This is just all God-ordained," Ranada said. "Everybody has a destiny, and I do believe that God, I know for a fact God has his hand on my son. I can't imagine life without him." Savion said he plans to enjoy his senior football season at Clayton and graduate early to join the Wolfpack in spring of 2019.